Sufi Whirling Ensemble or Samaa, often referred as Sufi Dancing is a spiritual ritual attributed to Mevlana Rumi, a form of meditation he performed connect to God and discover Self. Today it is performed by Mevlevi order dervaishes in ensemble especially in Turkey. Details of the 7 phases of whirling ceremony can be found here. The derveshes both rotate around themselves s as well as around the spiritual mentor, who remain stationary. It is similar to movement of planets around the sun, which is both rotation on axis as well as revolution around the sun. The dervishes (also semazens) raise right hand to connect with heavens , while the left hand pointing downwards symbolises distribution of the knowledge to creation, hence the derveshes becomes a vehicle from which guidance is passed through. The purpose of whirling, like all rituals, is to control ego, and reach station where link between creator and creation is established. 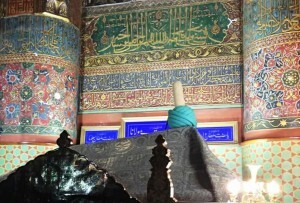 The whirling Sufi (Semazen) wear a long woollen hat (Sikke), usually made of camel skin. Following Hamd and Darood, the whirling ceremony begins as dervaishes begin to whirl around. The right hand is raised to sky for receive God’s benfecience and blessings and left hand is directed towards earth and it’s dwellers as such is distributed. Sufi becomes a medium from which the communication takes place and it leads to state of ecstacy as whirling continues. Download the world’s largest collection of Samaa or Whirling Dervishes Sufi Music in MP3 format.